I love creative business ideas, especially if they involve flowers. This is why I was rather excited when Jess firstly contacted me about launching a flower delivery service in her city, Cardiff. And I love creative ideas especially when they involve a local, fresh and genuine process. Jess plan was to pick up fresh flowers from the local market every morning, to create a new composition each day to deliver fresh. And don’t know about you, but that sounded like such a thoughtful, beautiful, refreshing idea to me! 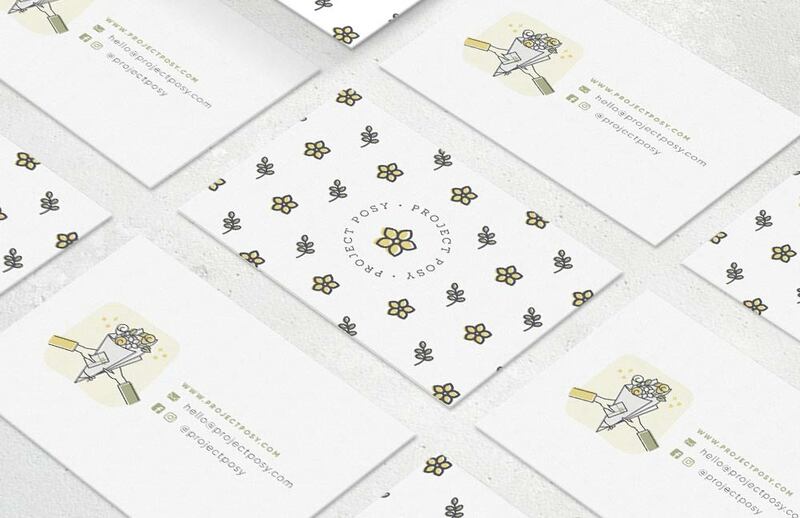 Building an identity and branding for flower delivery service Project Posy was fun, exciting and so up my street! Maybe it’s down to the fact I saw her brand being brought to life, from brainstorming the name to finished result. But every single piece in her brand board was a labour of patience and love, something I’m extremely proud of today. Jess’ new business idea didn’t even have a name when she contacted me, but her plans for it were clear. Her aim was to deliver fresh local flowers daily, quickly and at an affordable price. As simple as that. Whether to treat oneself, to celebrate a special event, say ‘thank you’ or ‘sorry’, she wanted her brand to be a genuine, fresh, local option for her ideal clientele. Since the plan was to create a new posy each day, using seasonal local flowers available that day at the market, we prepared for her photography to include any kind of colours. This is why we avoided any bright shade in her palette. Instead we focused on colours we knew would have worked with whatever flower she decided to use! 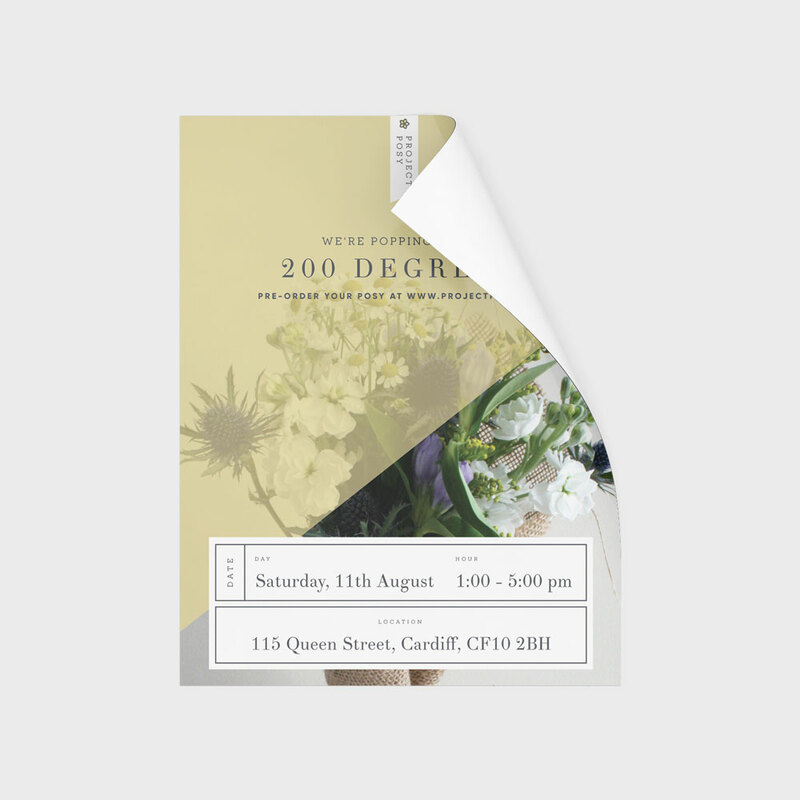 We went for an eucalyptus green and a touch of pale yellow, together with a selection of subtle neutrals. Something I’m doing a lot more often lately, is create drafts of both the logo and illustrations before even beginning to turn anything into digital. 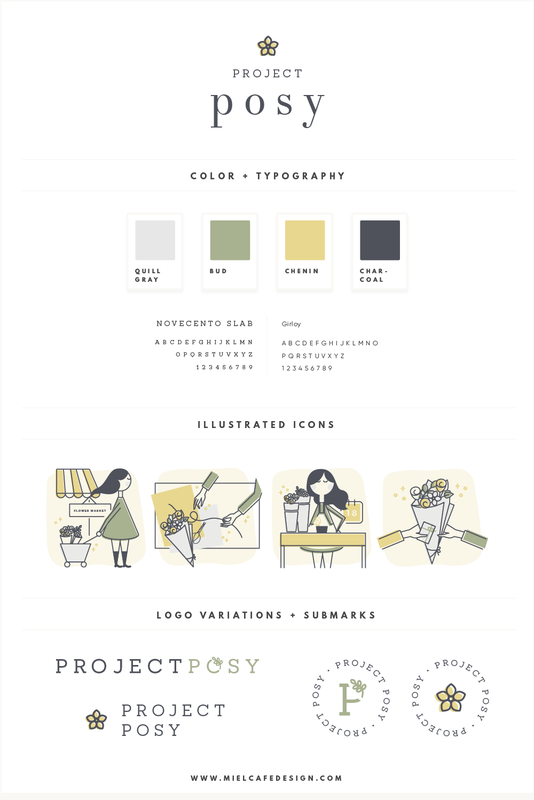 This because I often find that some components of the illustrated elements can work so nicely in the logo design, as brand icon, and this was the case with Project Posy. 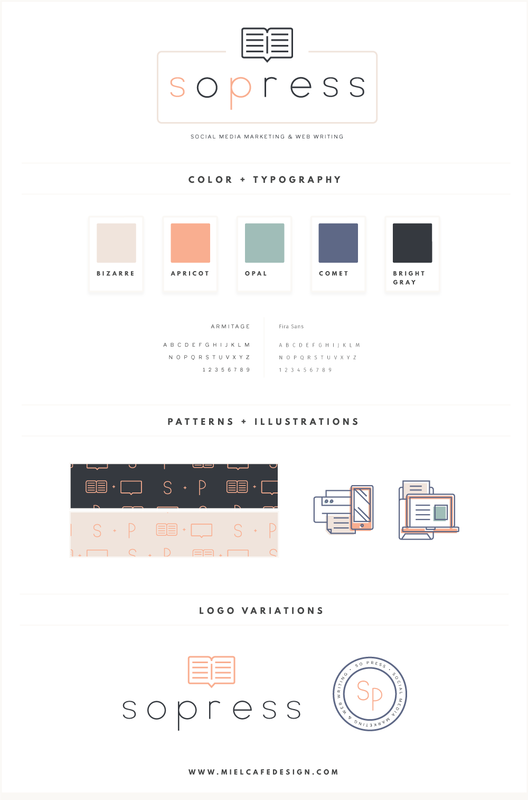 We created a set of clean custom digital icons for her brand, representing the steps that make her process unique. I had fun designing an illustrated character for her brand and dressing her up for all the different scenarios. 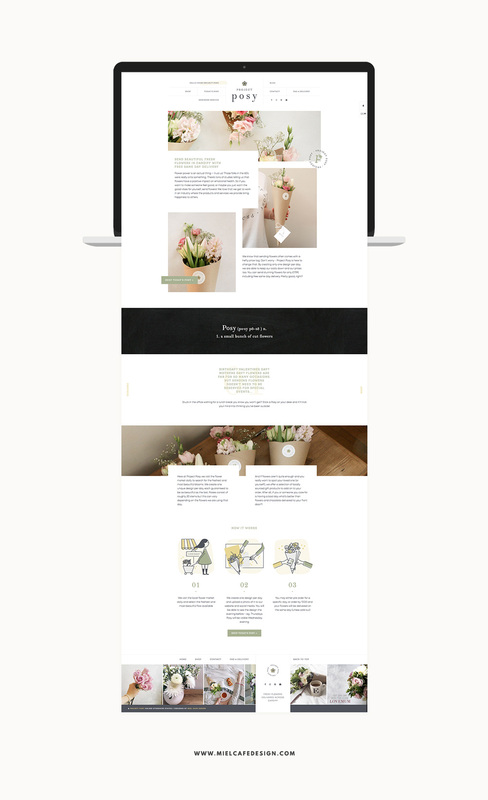 While designing her icons, Jess felt in love with a small flower illustration, that was simple but unique, and I instantly knew we had a brand icon at that point! Maybe it was down to the beautiful selection of fonts, but creating logo variations for her brand was so fun! Can you spot the many references to the illustrated icons, even with the small foliage element appearing in the illustrated bouquet AND logo variations? That’s the kind of nerdy branding stuff I like! Of course we built some patterns out of the brand icon and logo variations. You know I love patterns! But the thing I loved the most was being involved in the color choice of her tissue paper – it’s all in the details, I’m telling you. Jess also needed some photography backgrounds to make her daily shots prettier. So we selected a marble and a cement backdrops, simple but stylish, to go hand in hand with her branding. 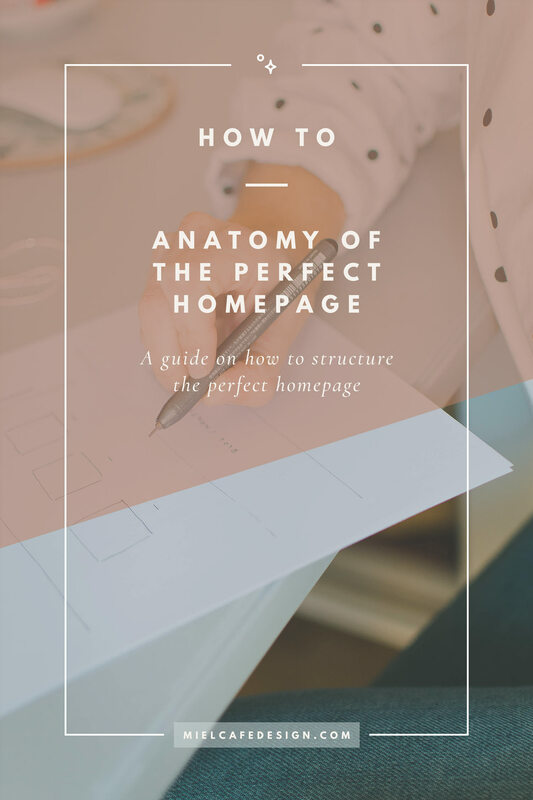 Her web design needed to be a statement piece starting from the homepage. And the different layout and disposition of elements, with a clean feel, definitely helped achieving just that! My favourite bit? The dictionary definition on the chalkboard background, so clever! 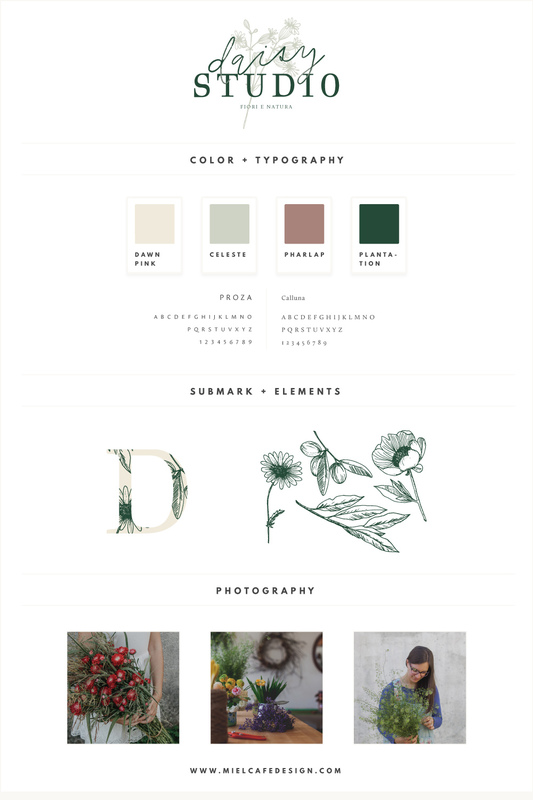 We went full-on with her website, curating every details for her ecommerce, blog and static pages. 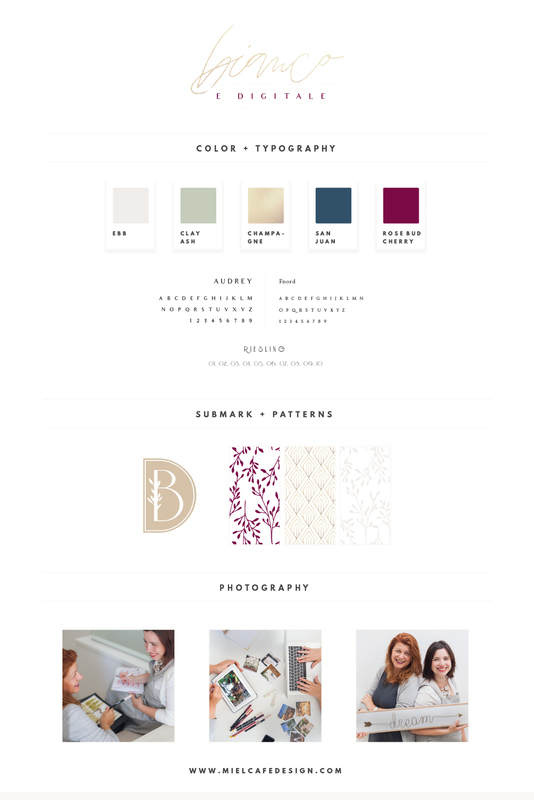 I couldn’t be prouder of how clean, unique and timeless her website feels. Look at that menu! I get so excited when it comes to branded stationery, especially if I can design pieces to package products in. I think that’s where you can see the care and love a business owner puts in his brand. And because of that I always love when a client decides that’s exactly what he wants to focus on. … but my favourite piece is the tag for her bouquets, which involved an extra set of coordinated illustrated icons to explain how to take care of your freshly arrived posy! Lastly, in occasion of her first pop up shop, we created a beautiful branded flyer design to spread the voice about the event in Cardiff! This was a project where I could see my own style (the one on the cleaner side) find a voice and shine, and I literally couldn’t be happier with the result. This brand is rich and detailed, yet clean and modern, and you can immediately tell it’s supporting a great idea in a first place! 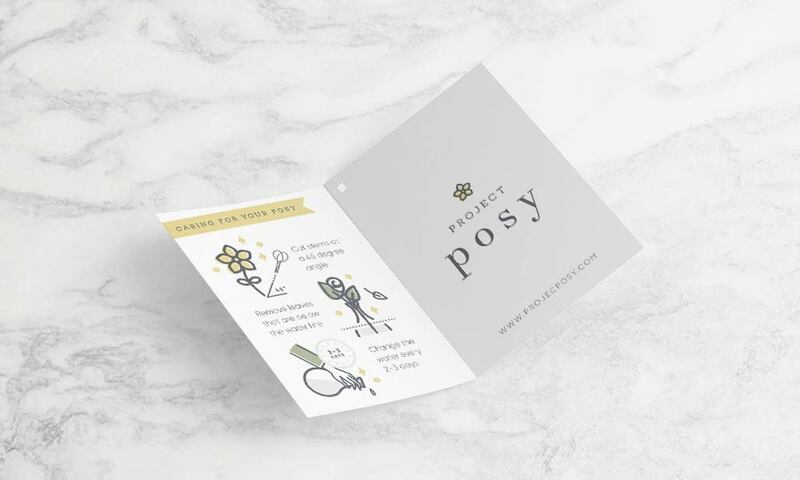 Branding for flower delivery service Project Posy was fun and inspiring, so go check out her website and beautiful daily bouquets! Loved the process behind this project? 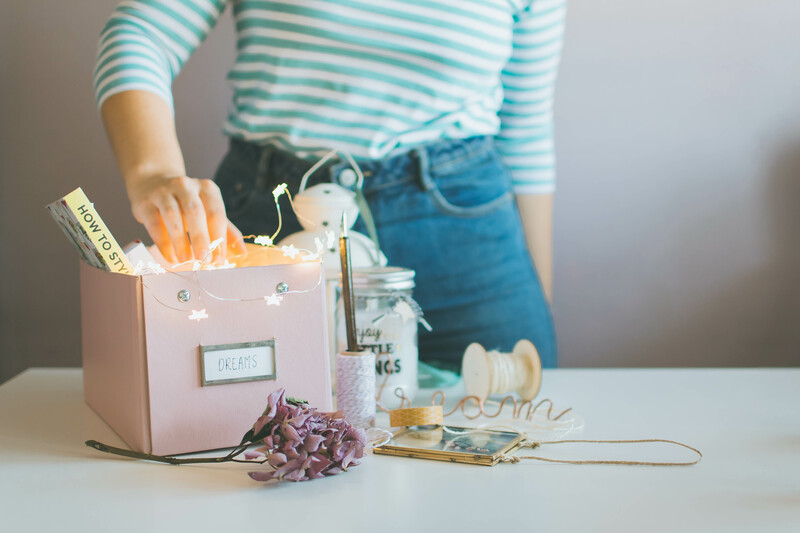 I’d love to work with YOU too: do you run a blog, website or small business? Do you need help with branding and finding a way to communicate with your dream clients? Get in touch today, I might have a couple of ideas on how we can work together already! Ohmygosh! Everything about this branding is adorable! I LOVE the icons you created. I hope her business does so well; she’s well on her way with your amazing help! Thank you Kim, very glad you like the end result! Those icons were so fun to make!